As stated in an earlier blog post the male brain is left hemisphere bias and that they often bond through actions rather than words. In the same instance the female brain excels at receiving information from both hemispheres concurrently through thoughts, feelings and words. They are capable of processing complex emotional and sensual information, and tracking the process with words i.e: real ’multi-tasking’. 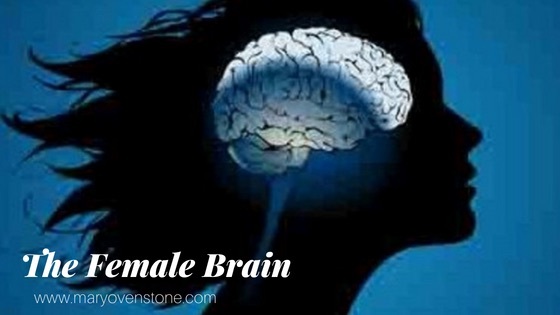 The female brain is geared for complex thinking and reasoning, weighing all their options, carefully and thoroughly. Women tend to be relational, where men are transactional (Gurian). We are forever seeking order and cooperation, ‘tending and befriending’. Our greater cortical connectivity and activity seen on neural maps are better connected throughout the brain resulting in whole-brained thinking. This is not to say that gut or intuitive feelings are overridden just added to thoughts for consideration. Where women look for and remember context, men look for and remember factual content. The female brain is wonderful at remembering emotional and sensual information. It is continually processing information internally, constantly assessing and re-assessing. The female brain is always busy re-running sentences, tones of voice, gestures, facial expressions, meetings, arguments with a colleague, etc. It can be concluded that the female brain has no ‘off’ state.